Thanks to our full-service, turnkey steel processing capabilities, H.W. Metals is able to produce not just parts and pieces, but complete assemblies and metal fabricated products, as well. We have provided metal fabricated products for a wide spectrum of projects, from seating plates/risers for the University of Washington’s Husky Stadium to municipal light poles for the City of Portland. A customer turned to H.W. 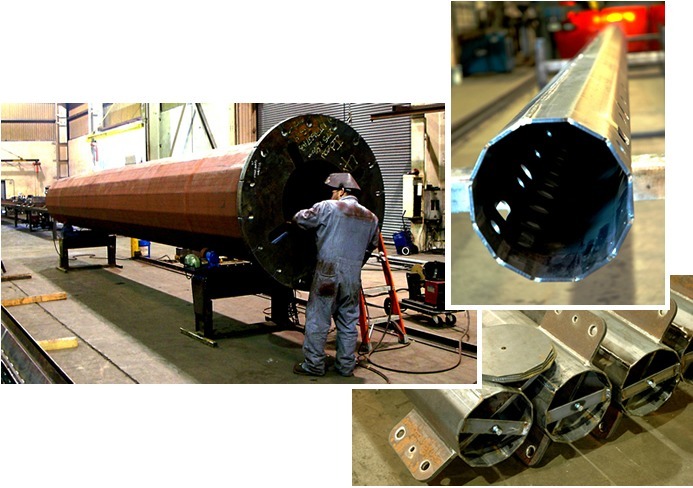 Metals for the fabrication of a number of large pressure vessels. From the raw plate steel to plumbing installation, we handled every step of the process. 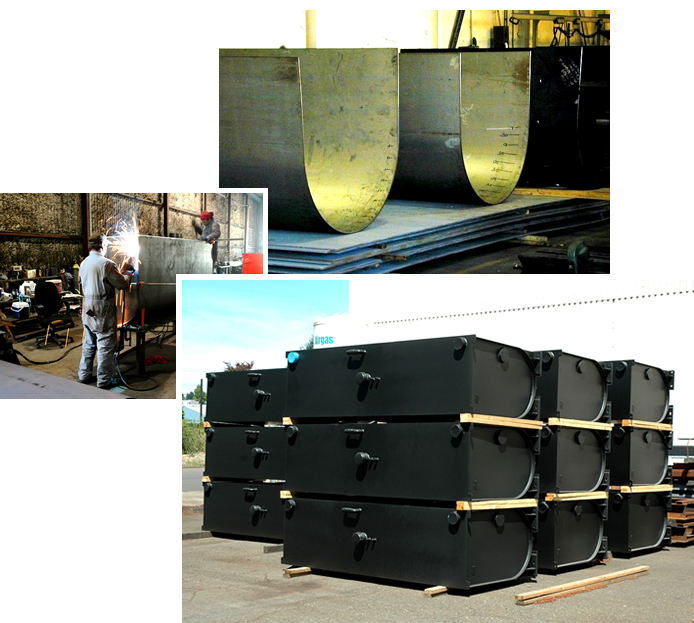 First, mill-sourced steel plate in various thicknesses, lengths, and widths for the vessels’ many individual parts was plasma cut to the customer’s exact specifications. All subassemblies were constructed from their separate components, and all parts and subassemblies were then crated and stored in our fabrication bay. The material for the containers themselves was then cut, and the pieces formed on our 750-ton Pacific press brakes. From there, the formed parts were tack welded together in the fab bay. The pressure vessels’ baffling, legs, sides, and various ancillary parts were also tack welded in place. After all parts were in place and proper fit and dimensions were ensured, our highly skilled welding team added permanent welds. The pressure vessels were then sent to a nearby paint shop. Upon their return, H.W. Metals plumbed the containers, pressure tested them, and performed a number of other quality control tests. H.W. Metals has the capabilities to cut, punch, form, and weld metal parts and components in short, medium, and 80-foot lengths. We provide these services faster and more efficiently than anyone else in our industry. Being a small, family-owned business, we can cater our processes to the needs of our customers, instead of making our customers’ needs work within our capabilities. Though few products leave our facility 100% ready for use, we can deliver assemblies and components that require very little additional finishing by our customers. We often fabricate most or all of the parts OEM projects require, but don’t finish or assemble them. We offer kitting services to package and deliver your components the way you need them, when you need them. We are your Number 1 domestic outsource option. 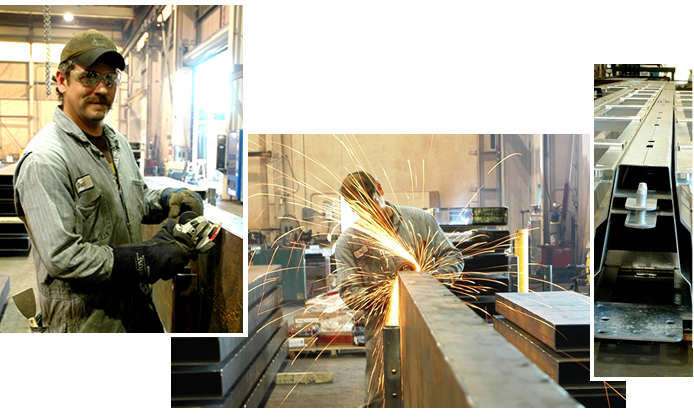 Request a quote on our turnkey steel processing services, or contact H.W. Metals for more information.